The characteristics that define a bird as a "bird of prey" include having strong, sharp talons, excellent vision, and a powerful beak that that is curved and built to tear flesh. Because of these features, it is not uncommon for people to become frightened that these birds may attack and harm them or their pets. Even with this fear, people tend to be fascinated by these powerful birds because of what they can do and how they do it. Some birds of prey, such as hawks, vultures, and eagles, are active during the day and rest at night. Others are active at night and sleep during the day, including owls that belong to the Tytonidae and Strigidae families. A study of the wingspan and of the length of these dangerous birds has been used to determine the largest birds of prey in the world. In terms of determining the largest bird of prey, the categories of both wingspan and length are very important and the following two largest birds of prey have been classified by these characteristics below. The California condor is the largest bird of prey in terms of length in North America, growing to an average of 109 to 140 centimeters long, and with a wingspan that averages about 3 meters across. This vulture was nearly extinct when, in 1987, the US government captured 22 of these birds from the wild and brought them to the LA and San Diego zoos to breed. As of June, there were 439 living either in captivity or in the wild in Arizona, California, and in the Baja California region of Mexico. When in the wild, these condors prefer areas that are near large trees, cliffs, and rocks. California condors are black with white underwings and have nearly bald heads. Their diet consists of the carcasses of dead animals, such as sheep, deer, horses, bears and cattle, and often fly distances of 250 km each day to find food. In spite of their very large size, California Condors can fly at speeds of up to 90 km/hour and at a height of 4600 meters above the ground. Their flight is graceful, and they choose high perches to roost on. It is not unusual for these condors to soar for miles without flapping their wings. These vultures tend to live longer than 60 years, which is a longer lifespan than most other birds. Once they have reached adulthood the only natural threat they face are humans. The California condor has been the topic of numerous stories told by Native Americans and has been a mythological symbol. Stories told by tribes about this bird sometimes describe it as a creator, where in other stories it is viewed as a destroyer. 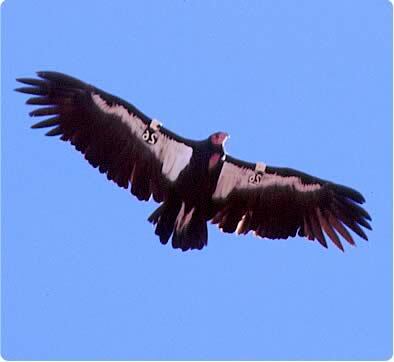 Other mentions have noted that the condor is responsible for the cycle of the moon. Some Native Americans have used the feathers from this bird to make headdresses, and some have sacrificed these birds in order to make ceremonial clothing. Some scientists believe that these actions have contributed to the species nearly becoming extinct. Why Is California Condor Endangered? Other reasons for the low number of these birds and their threat of extinction include their late sexual maturity age of 2 years, destruction of their habitats, lead poisoning, poaching, flying into power lines, and eating trash. Since cattle ranchers would often see these birds eating the carcasses of their cattle, they believed that the birds had been what had killed them. This resulted in them being killed by ranchers, which also contributed to their demise. The Andean condor has a very impressive wingspan of up to 3.2 meters wide, making it the largest bird of prey in the world based on wingspan. This vulture can grow up to 130 centimeters in length and is the heaviest flying animal or bird that exists today at up to 12.5 kilograms. The Andean condor is typically black in color with white patches around its wings and neck. It features a large, hooked beak which enables it to easily tear into its prey. Like other vultures, the Andean Condor is a scavenger, with its diet consisting primarily of carrion. The carcasses of choice include those of deer, boars, llamas, armadillos, and alpacas, and other large, wild animals, as well as domestic animals such as cattle, sheep, pigs, horses and dogs. Condors living near the Pacific coast feed on marine carcasses, such as whales and dolphins. Condors can easily go several days without eating and then eat several pounds of food in one sitting. Sometimes they eat so much at once that they are unable to fly. As the largest bird of prey in its native South America, this vulture lives in the Andes and Santa Marta mountains and near the coasts of the Pacific Ocean. It prefers grasslands and areas of high elevation away from forests where it can easily view its prey from the sky. It is not unusual for these vultures to travel in excess of 200 kilometers each day to seek carrion for food. The Andean Condor is well developed socially and engages in competitive play to determine pecking order. They are slow to mature and do not breed until they have reached 5 or 6 years of age. The female normally lays one or two eggs at a time every couple of years. If an egg is displaced, she will lay another egg in its place. Due to their loss of natural habitats by a growing human population and hunting, the Andean Condor became an endangered species in the US in 1970. As a result of taking these birds into captivity, their numbers have grown since that time. This vulture is used as a national symbol and bird in Bolivia, Chile, Ecuador and Columbia and is also recognized nationally in Argentina and Peru. 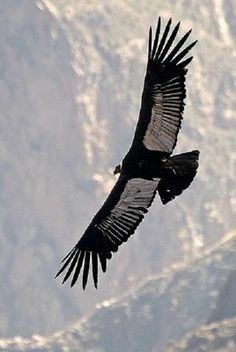 In mythology, the Andean Condor has been associated with sun deity, power and health.